The Illyria Trade Council (ITC) is a faction that has been difficult to track and put together the whole picture of who they are, what they do and where they go. They do not have a well-defined territory and they have the most trade hubs of any faction, and have hubs on both continents. Their hubs are also spread out across Elgea. They also travel to other territories that are not their own, and they have 2 different types of armies. At the time of this writing, they are camped near Centrum (https://elgea.illyriad.co.uk/#/World/Map/53/-8). This army is called "A Trade Enforcement division from the Illyria Trade Council" and is a typical patrol army for them. Their other type of army is called "A contingent of Roadguards from the Illyria Trade Council" and I would really like to find the road that the roadguards are guarding. Is there a road? I don't know, but there are several references in the Lore to a road or roads, so maybe there is a road to find. Maybe it will lead to a new Discovery for us to earn. I have some data on the ITC already, from the faction territory mapping project, but it is not enough to get the whole picture and story about this faction. Anyone can help with this project. All it takes is looking at the map around your own towns and scouting any camps if you see any. Then, forward the scout reports to me or post them here on this thread. I will compile a spreadsheet of the data and post it so that it is available to everyone. If the ITC does not camp near your towns and you would still like to help, posting their locations here on this thread will help alert others who are close enough to scout, especially if the ITC is camped in an unusual location outside of their hub territories. You can also send IGMs to players with towns nearby and ask them to scout, or let me know because I have a long list of players who scout factions for me and I can usually find someone. Tracking camp locations and movements is just as important as scouting, and scouting is not really necessary most of the time once you get used to the unit counts and army types. Some players simply track camp sizes using pack, gathering, horde, etc and that's fine for our purposes. It's when they are in an unusual or unexpected location that scout reports are important. So you don't really need to have towns near this faction or their hubs to help with this project. What is the purpose of this project and why bother? Since the descriptions of faction standings describe things in terms of "their territory" and because most factions have orders to patrol their borders, we have been keeping track of camp locations and unit counts when possible in order to get a clearer picture of their territories and a general idea of their behaviors. The camp locations can be used to make maps of each faction's territory. And when we get to the point where we can influence faction standings, we will already know where their territories are and how they behave. 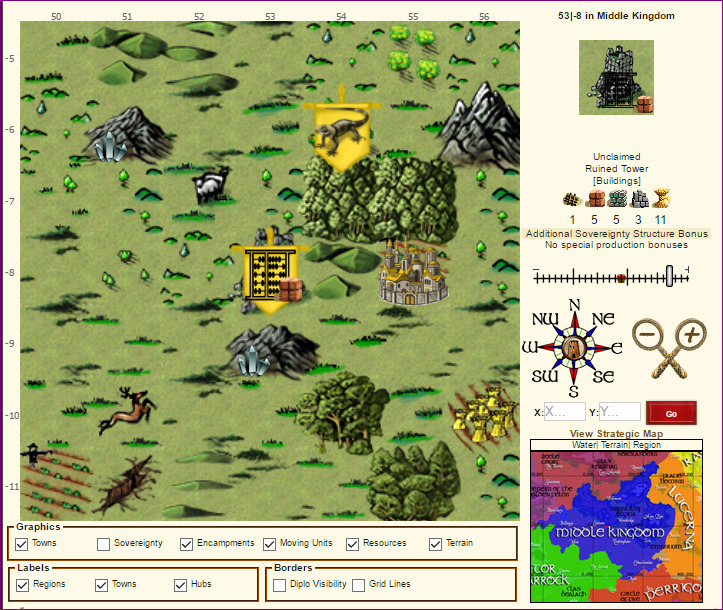 Currently, the hostile factions in the Broken Lands do attack players' towns and army camps. These attacks occur only in their territories. In the future, factions might intercept our trade missions that pass through their territories. We want to create territory maps now, before we get to that point, so we'll be ahead of the game. Each faction is unique, has its own set of behaviors and personality, sense of perception to the environment, level of hostility/friendliness to each race and alliance, etc. We also want to get to know them and be familiar with their personalities and behaviors, so when they do something that is not normal, we will know it isn't normal because we have something to compare it to. Town placement could potentially become much more complicated and having this information might come in handy for when Pathfinding features are implemented. So anyone who wants to help track the ITC, please post here or send me an IGM (https://elgea.illyriad.co.uk/#/Communication/ComposeMail/261298). Post camp locations, camp size, and a scout report if possible. This is great stuff Freyja. I love the work you are doing on factions. Even though we don't completely understand "why" they do what they do, I think this information is useful. I do hope there will be a discovery or they are part of a mystery or tournament eventually. Ah, Faction Action. We have Tensmoor to thank for creating this tool that goes along with Durc Tools. We are fortunate to have players like him and Digioso who created Dilly Tools. Faction Action shows the full regional map, trabe hubs and the radius for each, faction camps that have been reported to the server through Durc Tools, and all players' towns. There is an option in Preferences for Durc Tools to have the faction camp locations reported to the server, and this option must be turned on by each player who uses Durc Tools. Over time, these camp locations will fill the map and show us where each faction tends to make camps. It does not show where factions are currently camped, but rather it shows all of the reported locations from Durc Tools over time. So this process is dependent on players using Durc Tools and having the option selected to have the camp loactions reported. And since it was not being used, Tensmoor has disabled it for now. Faction Action would improve if more players were scanning the map with Durc Tools and reporting the camps. I'm sure he would enable this feature again if people were interested and willing to use it. When it comes to city placement, Faction Action is an awesome visual of the regional map with the trade hubs and faction territories, and also by having it show all towns. I can only imagine how awesome and useful it would be if we could get it populated with more faction camps. IMHO, I think it will be exactly the kind of tool we need, especially when we are able to influence faction standings. Done. Please continue to notify Freyja of any sightings as you were before so she can continue with her analysis. This tool is not (currently) fine grained enough for her requirements.